2007, EuroREA was transferred from SEA into the hands of EXARC. SEA was still a willing advisor, but EuroREA became the journal of EXARC, where the board had full responsibility, in this case delegated to the editor in chief. 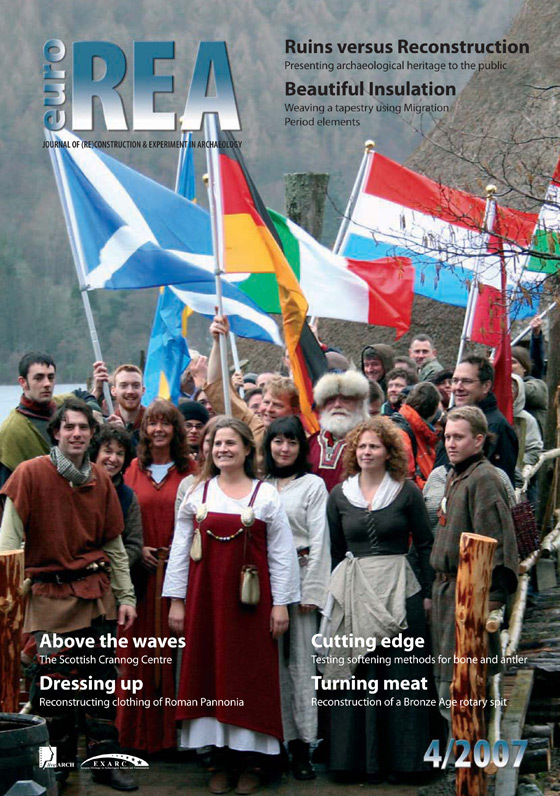 In September 2007, EuroREA 4/2007 was published; a bit thinner than in 2006 and progressively popular in content, without losing the high quality in editing and graphic design. In this number among others we have given much attention to liveARCH project, including the whole front cover. The size and amount of pages has proven to be the most satisfying. From this number on EXARC is the only one responsible for this journal. The Journal includes a discussion on presenting archaeological heritage to the public where ruins are compared in effectiveness to (re)constructions. An interesting Swedish adult education in ancient techniques is described in theory and highlighted with the example works of two Czech students. Laboratory experiments also are welcomed, witnessed by an article on techniques on softening bone and antler in prehistory. Standards for presenting field data and an engineering point of view on the reconstruction of aisled prehistoric houses , described in the 1980s but not published until now also found a spot in EuroREA. Several book reviews discussed publications on education, bronze casting and Hallstatt textiles to name just a few.